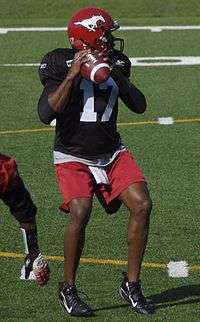 Akili Smith at the Calgary Stampeders 2007 training camp. Kabisa Akili Maradufu Smith (born August 21, 1975) is a former American and Canadian football quarterback. He was drafted by the Cincinnati Bengals in the first round (3rd overall) of the 1999 NFL Draft, the third quarterback in the first three choices, behind Tim Couch (Cleveland Browns), and Donovan McNabb (Philadelphia Eagles). He played college football at Oregon. Smith also played for the Green Bay Packers, Tampa Bay Buccaneers, Frankfurt Galaxy, and Calgary Stampeders. Smith attended Abraham Lincoln High School in San Diego, the alma mater of Marcus Allen and Terrell Davis, before choosing to go to Grossmont College, a junior college in the San Diego area for two years, prior to transferring to the University of Oregon. Smith came to the foreground of draft discussions because of his performance in his senior season at Oregon, throwing 32 touchdown passes in only 11 starts in college. 1997: 108/200 for 1,385 yards with 13 TD vs 7 INT. 89 carries for 183 yards and 2 TD. 1998: 215/371 for 3,763 yards with 30 TD vs 7 INT. 82 carries for 184 yards and 4 TD. In the 1999 NFL Draft, a year when five quarterbacks would be drafted in the first round, Smith was the third quarterback and third player selected overall, by the Cincinnati Bengals. Prior to the draft, there was an effort by New Orleans Saints' head coach Mike Ditka and management to get the Cincinnati Bengals' high draft position so the Saints could get Ricky Williams. The final offer, which was refused by Bengals management, was for nine draft picks, several extra in that year as well as many the next year. Instead of taking the trade, the Bengals stayed with their initial decision to draft Smith, who, while athletic, (he had also played two years of minor-league baseball and ran a 4.66 40-yard dash) was still largely unproven, having only succeeded at the college level for one season. Smith missed large periods of 1999 training camp due to contract disputes; many pundits later speculated that his absence from this part of training camp hurt him in the seasons to come. Despite showing athleticism in his early games, he failed to grasp the Bengals playbook fully, and never established himself with the team. During the four years he was with the Bengals, he would start in only 17 games and throw just five TD passes next to 13 interceptions, eventually leading to his release in 2002, after riding the bench mostly during the previous two years. In 2003, Smith tried out for the Green Bay Packers, as Brett Favre's backup. He was, however, unsuccessful there and was later released. In 2005, he was released by the Tampa Bay Buccaneers after a stint in NFL Europe where he started four games for the Frankfurt Galaxy. In 2007, Smith signed a two-year contract with the Calgary Stampeders of the Canadian Football League, where he was expected to compete for the starting quarterback position with another former NFL player, Henry Burris. After an unimpressive debut in an exhibition game against the Edmonton Eskimos, Smith played well in the final exhibition against the Saskatchewan Roughriders. Though listed going into the game as the third-string quarterback, he completed three touchdown passes in only one half of play, including one to former Kansas City Chiefs wide receiver Marc Boerigter. In his first regular season action, replacing Burris in the second quarter on July 12, Smith struggled against the Toronto Argonauts. He finished 6-of-10 for 63 yards, no touchdowns and three interceptions. He also lost one fumble. He was then pulled at the end of the half. After an unimpressive showing against the Roughriders on October 8, 2007, going 4-of-12, for 37 yards, along with the impending return of a healthy Burris, the Stampeders released Smith on October 10, 2007. After retiring from football, Smith was the quarterbacks coach for Grossmont College. Smith is a deacon at a Missionary Baptist church and plays football for "God's House", a flag football team. In March 2010 Smith joined the University of California's football staff as a graduate assistant to work with the offense. Cal head coach Jeff Tedford previously coached Smith at Oregon when he was offensive coordinator. In 2012, Smith took over as quarterbacks coach for St. Augustine High School in San Diego. Smith is also planning on finishing the college degree that he started at the University of Oregon. ↑ "Special Feature on Lincoln High School's History". San Diego Union-Tribune. Retrieved 2007-09-28. ↑ "Akili Smith, DS #4 QB, Oregon". NFLDraftScout.com. Retrieved 2009-01-16. ↑ "Tight end Tyrone Davis also released". ESPN.com. ESPN. 2003-08-26. ↑ "Akili Smith Stats". ESPN Internet Ventures. Retrieved 23 May 2014. ↑ Sports Illustrated, July 2009, "Where Are They Now? : Akili Smith"
↑ "Coach Bio: Akili Smith". Retrieved 2010-10-21. ↑ "St. Augustine receives boost from former NFL quarterback". Retrieved 2012-11-05. ↑ Olivieri, Anthony. "Former draft bust Akili Smith has a surprising new path". Yahoo!Sports. Retrieved 1 February 2013.